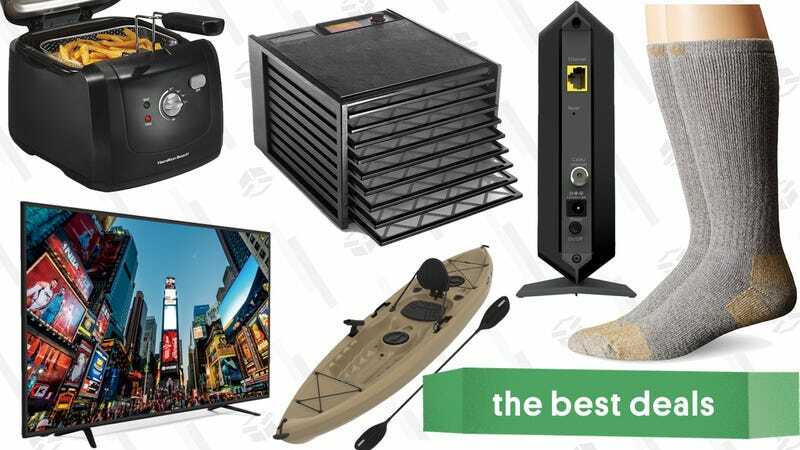 A $420 65" TV, a kayak designed for fishing, and a highly rated food dehydrator lead off Saturday’s best deals from around the web. A lot of Alexa devices got updated this week, but the standard Echo wasn’t one of them. So if you buy this refurbished model for $70, you aren’t missing out on any new features. If you’re still paying a modem rental fee to your ISP, buying a modem outright will pay for itself in short order. This model from NETGEAR supports cable internet speeds up to 500mbps, and at $70, it’s cheaper than ever. The $80 list price is actually already $20 less than usual, and a $10 coupon on the page makes the deal even better. $420 for a 65" 4K TV? Even for this barebones RCA with no smart apps or HDR support, that’s a blazing hot deal. Plus, everyone who buys it gets free two day shipping, or you could pick it up at your local Walmart to have it ready for this weekend’s football games. The back of your home theater cabinet doesn’t have to look like a rat king of tangled wires. These velcro sleeves can keep everything tidy, and is reversible, so the outside can be either black or white. Get 118" of the stuff for just $10. You can read my original Anker Roav DashCam impressions here, but the C2 model has a few differences. Notably, it operates at a wider temperature range, so if you live in an extreme climate, this is the model for you. It also upgrades the screen from 2.4" to 3", and packs in a new Sony Exmor sensor and Ambarella A12 chipset. However, unlike the original, it doesn’t include Wi-Fi, so you’ll have to plug your microSD card into a computer to export your footage. Whether you’re getting a brand new Apple Watch today, or just want to accessorize your old one, this Milanese loop band is a great deal at $7, with promo code NPXMFVM6. That should work on any color and size, so you can match your watch’s color, or create a nice contrast. Given how many Lightning cables seem to wear out at the necks, it’s surprising that 90 degree cables aren’t more of a thing. You can grab two nylon braided cables for $12 from Aukey today with promo code AUKEYA64, which would be a great price for two nylon-braided Lightning cables anyway, even without the unique connector. Update: We posted this 55" TV at $300 a few weeks ago, and it promptly sold out. It’s back in stock today at $320, but the 49" is also on sale for $250. While it doesn’t have the best picture quality out there, it’s tough to complain about a 55" 4K TV for $320, or a 49" model for $250. Both include HDR, though with a distinct lack of specs on the page, I’m going to assume that’s not Dolby Vision. And while they doesn’t have apps onboard—pretty typical at this price level—they do have Chromecast built in, so you can stream video easily from your phone, which is very rare at this price. You can never have your files backed up in enough places, especially when 1TB externals are going for $40. 1TB drives have been stubbornly stuck around $50-$60 for the last few years, and this is as cheap as we’ve ever sen one from a top-tier manufacturer. Anker’s nylon-wrapped PowerLine+ Lightning cables aren’t just nicer and more durable than Apple’s cables; they’re also cheaper. As long as you don’t mind buying them in red, you can save on all four sizes today on Amazon. Just be sure to note the promo codes. For one day only, Amazon’s matching its Black Friday discount on the 4K/HDR/Dolby Atmos-packing Fire TV. While they last, you can snag the streaming box stick dongle for $40, a $30 discount, and a match for an all-time low. This is one of the best streaming devices you can buy at any price, so if it’s been on your wish list, don’t miss this deal. Whether you’re getting a new iPhone, keeping your old one, or even if you’re an Android user, Anker’s big iPhone charging sale has a deal or four that you can take advantage of. There are too many deals to list here, but we’ve included them all in this post. This deal is almost $40 less than usual, and just a few bucks shy of an all-time low. But it will only last through the end of the day or until product sells out, so don’t wait for the sale to dry up. Free ground beef. Forever. Do I have your attention? Butcher Box ships grass fed beef, heritage grade pork, and free range chicken right to your door for less than $6 per serving, and if you sign up with our exclusive link, you’ll also get 10 ounces of uncured bacon in your first box, and two bonus pounds of ground beef in every box you get delivered for the life of your subscription, for no additional charge. That’s enough for eight burgers every time you get a shipment. Your reader-exclusive bonuses come bundled with any of Butcher Box’s pre-selected boxes, which are priced at $129 for 24 servings, or $238 for 48 servings, which can be delivered every 30 or 60 days. For a nominal surcharge, you can also build a completely custom box, with your choices of proteins. Note: You’ll have to enter your email at the beginning of the process. I know, it’s annoying. C&M Personal Gifts specializes in laser-etched drinking glasses with great designs and clever phrases, and several of their best are 20% off in today’s Amazon Gold Box. Cheers to that! Sometimes, there’s just no substitute for deep frying. This 2L Hamilton Beach fryer is only $39 today, includes a basket, and most importantly of all, doesn’t get hot on the outside. The lid can even close over the basket handle, cutting down on splatter while your food cooks. Anker’s Eufy RoboVac line has been a hit with our readers, to say the least, and now you can save on their new slim model. The 11s usually sells for $230, but for a limited time, you can snag one for $180 by clipping the $50 coupon. This LED light strip doesn’t include smartphone control, a music-pulsing microphone, or RGB lights. What it does have is a $5 price tag, so go ahead and add some accent lights around your house. My parents bought a wood pellet grill (a Traeger, to be precise) a couple years ago, and holy crap it’s cool. You pour wood pellets (there a ton of different kinds) into the container on the left side of the grill, select the temperature you want with a digital dial, and the grill feeds the pellets into a heating element at whatever speed is necessary to maintain that exact temperature. The result is smokey deliciousness with the ease of using an oven. This Pit Boss model gives you a massive 700 square inches of cooking space, and $337 with free two day shipping is an absolute steal. Just remember to invite me over the first time you use it to smoke a brisket. Update: This was available earlier in the week, but it’s back in stock now if you missed it. While we usually see bigger discounts on major sales holidays, if you want an Instant Pot pressure cooker in time for Thanksgiving dinner prep, this $15 discount on Amazon is a solid deal. In addition to pressure cooking (which is a miracle), this is also our readers’ favorite slow cooker, and one of their favorite rice cookers too. To put it simply, it’s one of the most versatile kitchen gadgets you can own. You can serve up professional-looking fajitas at home with this Lodge serving pan, now down to an all-time low $13, which is less than you’d spend on a half pound of chicken fajitas at your nearest Mexican joint. You wouldn’t want to cook directly in this pan, but you can throw it in the oven or on the stove to heat up, then add your fajitas later for serving. It also includes a wooden base and a chili pepper handle mitt. Meat not included, sadly. You might have a bathroom scale at home that works just fine for weighing luggage when you’re leaving town, but this hanging scale is small enough to take with you, so you can make sure you won’t get dinged for all of those heavy souvenirs on your return trip. All it has to do is save you from an overweight baggage fee once, and it will have paid for itself several times over. Packing cubes can make organizing clothes and toiletries for your next trip a little less hellish, and eBags’ cubes are widely considered to be among the best. They don’t go on sale often, but you can save 20% on a three-pack today from Amazon by clipping the 20% on-page coupon. You can even choose your favorite color. It’s Sur La Table’s anniversary (don’t tell me that you forgot! ), and that means tons of deals on popular kitchen gear. Obviously, the rarely discounted All-Clad pans are a highlight, and there are some great deals on gorgeous Miyabi Kaizen II kitchen knives as well, but with hundreds of eligible items available, you should definitely check out the site, and drop any suggestions in the comments. All orders over $59 ship for free as well with promo code SHIPFREE. ThermoWorks’ ThermoPop is the less expensive and ever-so-slightly slower little brother of our readers’ favorite meat thermometer, and the company is offering a very rare deal on it today when you buy two or more. Just add at least two to your cart, and you’ll get them for $20 each, down from its usual $34. These make tremendous gifts, so stock up now, and stuff them in some stockings in a few months. At 3,500 running watts (4,000 surge), this Sportsman generator could damn near power your entire house, or the most high-tech tailgate party in the entire parking lot, and it can be yours for $270 today from Walmart, which is about as cheap as you’ll ever see a generator this powerful. Onboard, you get four 120V outlets, plus an RV outlet if you want to power your camper. Plus, it can run off both propane and gasoline, so you’ve got some flexibility. Firstleaf is an online wine club that learns your preferences, offers tons of options, and most importantly, saves you money compared to buying from the store. It’s a solid deal any time, but it’s even better for our readers today. Every new Firstleaf member gets an introductory delivery with three bottles of wine for just $15, plus $5 shipping. Considering that you aren’t locked in and can cancel any time, that’s a bargain. But it gets even better for our readers, as promo code Kinja will waive the $5 shipping charge, for a limited time. That’s three bottles of wine (all of mine had MSRPs over $20) for just $5 each shipped, with no commitment. You can read more about the service in my review, but if you choose to remain a member (I did), every box thereafter includes six bottles for $80, plus $10 shipping. It’s time for another incredibly exciting sale on socks! This weekend, Amazon’s discounting a bunch of premium Carhartt socks for men and women. They’re mostly marketed as “work” socks, but they’d be great for hiking, or just wearing around the house as the weather cools down. Nothing will connect you to the water quite like fishing from a kayak. Lifetime’s Tamarack Angler is designed specifically for this purpose, and Walmart has the tan one marked down to $230 right now, or about $80 less than Amazon. You won’t have to tell any fish tales about how great a deal you got. These leather wallets look great, can hold a ton of cards and cash, and block RFID signals for just $10 in today’s Amazon Gold Box. Did I mention that they come in a bunch of different colors? It’s time to start thinking about layering, and you can buy a whole bunch of layers for cheap with Columbia’s up to 60% off sale section. Everything on this page is already on sale, and promo code COLUMBIA60 will save even more (though the exact discount varies). If you add something to your cart, apply the code, and then go back to the sale page, you’ll see final prices for all of the items. Almost everything comes out to under $60, so stock up! Waterpik is an easier (and they would argue more effective) way to “floss” between your teeth, and Amazon is once again offering the popular Aquarius model for $50, after clipping the $10 coupon. Your teeth will thank you, and so will your wallet. Timbuk2 makes some seriously great bags, and you can save 30% on all of them during the company’s Friends & Family sale. Just use promo code FRIENDS30 at checkout to get the deal on any full-priced item. You obviously can’t go wrong with a Timbuk2 messenger, but we’re also big fans of the lightweight Parachute collection and the reader-favorite Copilot luggage line. Time To Shade offers great prices on premium glasses, and you can take $15 off any order of $90+ off using code KINJA15. Shop a huge selection of frames from brands like Ray-Ban, Ralph Lauren, Calvin Klein, and Tagheuer, to name a few, then configure them as standard prescription eyeglasses, prescription tinted, or non-prescription sunglasses for no additional charge. All lenses include an anti-glare and anti-scratch treatment, and for a reasonable additional fee, you can add on polarization, a mirror tint, or progressive lenses. This portable, dual seat massager from Mynt can be used at home, the office, or in the car, and it’s just $100 with code M2510111. Choose between targeted Shiatsu or broader kneading massages, or a combination of the two, and add heat or lock in set areas and rotations with the touch of a button. Our readers listed these Crabby Wallets as one of their favorite front pocket wallets, and today, you can save $5 off a whole bunch of different colors and materials (click here for elastic models, and here for canvas) when you clip the on-page coupon. These wallets can hold up to 10 cards, include a ring for your keys, and are crazy thin. And at $10, they’re so cheap, you’ll have a lot of money left over to put in them. Consider, if you will, the headlamp. I’m willing to bet that you’re picturing an elastic strap with a big lump on the front containing the light and the battery. That is, after all, how most of them are designed. But BioLite has a different idea. The makers of that incredible camp stove that charges your phone are back with the HeadLamp, a blindingly bright wearable light that puts the battery behind your head, and uses modern LEDs to create a lamp up front that’s thin, comfortable, and extremely bright. The light itself toggles between modes with the press of a button on the top of the assembly (the button is a little hard to find and press by touch, my one real complaint about the HeadLamp), and you get the option of a wide or focused beam in multiple intensities, a strobe light, and a red lamp for when you don’t want to wake up a tent mate, or mess up your eyes before a stargazing session. And despite the light enclosure’s thin design, you can also swivel the lamp downward at multiple angles to fit your needs. The battery on the back is connected to the light by a thin cable, most of which runs inside HeadLamp’s extremely comfortable headband. This is a modern, USB-rechargeable gadget—no bulky AAs to be found—and can run for a whopping 40 hours at minimum brightness, or 3.5 at full blast. And trust me, at 330 lumens, it’s bright. There are no smartphone-connected features, RGB LEDs, or, like, Alexa support here, which is probably a good thing. While HeadLamp takes cues from modern electronics, it’s still just a head lamp at the end of the day, albeit a very nice and thoughtfully designed one. I wore one around at the Outpost trade show earlier this month, and everyone who saw it was jealous. You can preorder it starting today on Kickstarter for $49, ($13 off MSRP, apparently), and backers will also receive an exclusive light-diffusing carrying case that turns the HeadLamp into a hanging lantern for your tent. BioLite is promising delivery in time for the holidays, and they have a good track record. You can always save big at REI Outlet, it’s basically REI’s clearance page, but now you can take an extra 15% off your entire order with code OUTSEPT18. Some very notable items are included too, like Marmot’s Precip and Minimalist, both of which landed top spots in last week’s co-op for Best Rain Coats, while Smartwool is our reader’s favorite everyday men’s sock maker. Other deals include outerwear, leggings, flannels, camping gear, and more from your brands like Patagonia, the North Face, and Arc’teryx to name a few. You should never need a reason to get outside, but this extra savings will make it that much easier. Sorting through the deluge of (mostly mediocre) online recipes can be a slog, so it’s worth taking a look at this Kindle cookbook sale. All 140+ included books are marked down to $5 or less, including books from celebrity chefs like Gordon Ramsay, and practical options like Instant Pot cookbooks. A few of our picks are below, but head over to Amazon to see the rest. The Hero’s Edition of The Legend of Zelda: Breath of the Wild—Creating a Champion looks like it’ll be the ultimate holiday gift this year for the Zelda fan with everything, and preorders just got marked down to $60, from the usual $100. And if you order now and it gets any cheaper prior to release, you’ll automatically be charged the lowest listed price. This deluxe slipcase edition features the royal blue worn by the Hylian Champion and includes the Creating a Champion art book with an exclusive cover, a map of Hyrule printed on cloth, an art print of the Champions’ photo Link hangs in his Hateno home, and a beautiful glass replica of a spirit orb. Pirate roller coaster. Pirate roller coaster? Pirate? Roller coaster? I don’t really understand the theme behind this LEGO set, but it looks like fun, and it’s on sale. It’s a 3-in-1 set, so you can build it a few different ways. If you’ve got the room for it, table tennis is by far the best indoor household game, and this space saving model from EastPoint is just $90 today at Walmart. When you’re not using it, the whole thing can fold up to take up less floor space. Every board game collection needs a copy of Scrabble. This is just settled law at this point. $14 gets you the 1949 edition today, which includes a classic board, a velvet tile pouch, and wooden tile trays. This month’s Humble Monthly already featured Overwatch as the early-unlock game, which is pretty damn good, but if you’re still on the fence, they just added Dungeons 3 and Hidden Folks as well. For just $12, you’ll get instant access to all three games, plus more mystery games when the month unlocks in early October. And of course, every game you get is yours to keep forever, even if you cancel. If you somehow don’t own Overwatch yet, the Legendary edition is back down to $30 on PS4 and Xbox One, matching an all-time low. The Legendary package includes 10 extra skins for the game, plus bonus Overwatch-themed content for Blizzard’s other games as well. But don’t worry about all of that; the underlying game is a must-own even without any extras. PC gamers, your best bet is to sign up for Humble Monthly, which will get you Overwatch for just $12. If you have any notable holes in your Nintendo Switch game library, you can fill them today with rare discounts on first party Nintendo games. Breath of the Wild, Super Mario Odyssey, Mario Kart 8 Deluxe, and Mario Tennis Aces are all marked down to $45, and that’s just for starters. Check out the image caption above for all the deals. There are people who occasionally pull out a copy of Catan or Scrabble for a game night, and then there are people who spend a couple hundred bucks on Gloomhaven, or play through the roguelike Pandemic Legacy with the same group for months on end. This board game table is for them. When you aren’t playing, the leaves cover up the play surface, transforming the table into a regular looking dining room table without any garish, gaming-centric design details. I think it’s safe to say that game night will be at your place in perpetuity once this arrives.